My recently purchased Leather Coral has developed a shiny finish to its top surface area, similiar to clear coat on a car finish. I had recently moved 90% of the rockwork from this tank to my upcoming larger tank with a slight change in nitrates (40ppm)as a result. I have performed a water change to help correct this issue (all other readings normal). The coral was feeding prior to this. Is this a defence response (slim cover)? Any help would be greatly appreciated. Your 'problem' is completely normal. All leathers like this go through this process from time to time. If you have hermits in there you may notice they like to snack on the slime occasionally. Give it a few days and it should clear up on its own and be back to normal polyp extension. they will slime up from time to time, it is normal for leathers and part of their growing / shedding. how does he look other than the slime? how much flow is it getting, they like a bit of flow and it will help blow the slime off. when you moved the rock, did the leather start getting a lot more light? 40ppm is really to high ( i know you know ) and it could also be brought on by the stress of rapidly changing parameters, as long as he is still solid ( not melting or deteriorating ) and you are correcting the nitrate spike i wouldn't panic to much just yet, give him a few days. The coral was only 4" off the floor of the tank but fully exposed to the lights. It now sits directly on the bottom of the tank, so less light as opposed to more. I think, I took too much live rock out of this tank to fast and simply affected the biological filter (I wanted my original live rock to cure with the new (fully cured) live rock in the new larger tank). The coral looks the same excluding the shiny surface. I have moved it to a different area to get more water flow across its path. So far this is the only coral showing any changes in appearance. I will continue to monitor water conditions daily. 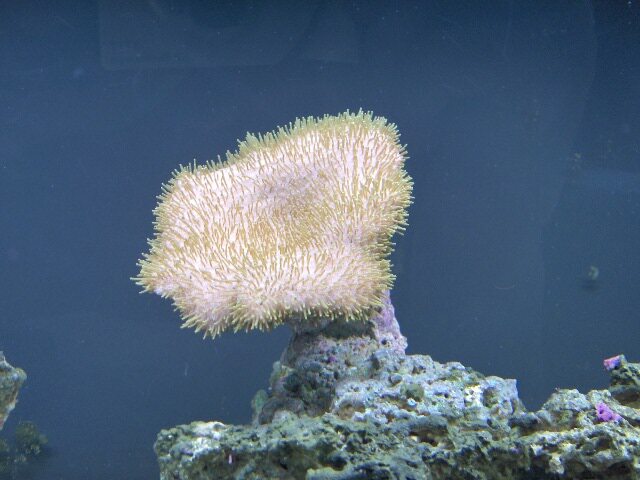 ya its quite normal for sure.. if it has less light it could also be a problem.. this coral usually adapts well to changes ( from experience anyway ).. but should be done slowly.. if it doesn't come back in a few days.. try moving him closer to the light.. also.. mine dont like that much current.. I had to find him a spot blocked by LR to slow down the flow. 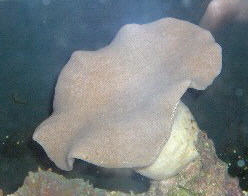 The coral has now released its slime cover and feeding normally again. Thanks for the assistance, first Leather Coral purchase.